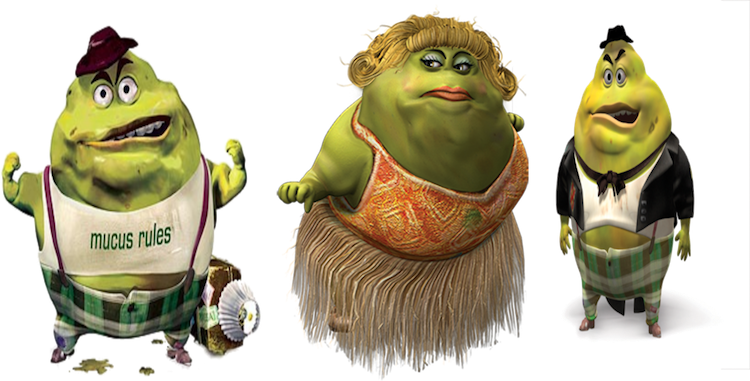 Combining two pop-cultural items: zombies and nasal mucus, especially in the form of green boogers. Plus popcorn, of course. Don’t let the name spook you! Zombie Boogers are a perfectly kid-friendly Halloween treat. 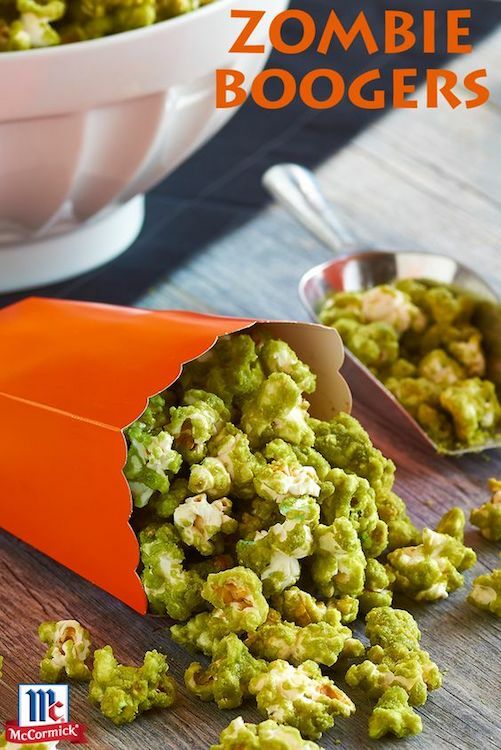 Tint the sticky-sweet butter syrup with McCormick® Food Colors, toss over popcorn and bake to create a greenish treat that resembles … well, you know what! … A new version of the zombie, distinct from that described in Haitian folklore, has also emerged in popular culture during the latter half of the twentieth century. This “zombie” is taken largely from George A. Romero’s seminal film Night of the Living Dead , which was in turn partly inspired by Richard Matheson’s 1954 novel I Am Legend. The word zombie is not used in Night of the Living Dead but was applied later by fans. The monsters in the film and its sequels, such as Dawn of the Dead and Day of the Dead, as well as its many inspired works, such as Return of the Living Dead and Zombi 2, are usually hungry for human flesh, although Return of the Living Dead introduced the popular concept of zombies eating brains. The “zombie apocalypse” concept, in which the civilized world is brought low by a global zombie infestation, became a staple of modern popular art. Etymology: Probably an alteration of boggard n.2 [see below], after boo int. and –er suffix1. With sense 2 compare slightly earlier boogie n.1 2 [below] and the discussion at that entry. Etymology: Probably an alteration of booger n.2, after bogy n.1 and –y suffix6. Compare boggard n.2 [below] and also boogie n.2. For a similar association of the senses ‘evil supernatural creature’ and ‘nasal mucus’ compare booger n.2 2 [above] and bogy n.1 5, and compare also sense ‘nasal mucus’ recorded in Dict. Amer. Regional Eng. at boo n.1 (1892; compare boo n.1 2), bugaboo (1899; compare bugaboo n.), and poker n.2 (1892; compare poker n.3). ☛ OED2 on boggard| boggart n.2 A spectre, goblin, or bogy; in dialectal use, esp. a local goblin or sprite supposed to ‘haunt’ a particular gloomy spot, or scene of violence. Etymology: A word in popular use in Westmoreland, Lancashire, Cheshire, Yorkshire, and the north midlands, and of occasional appearance in literature since c1570. Evidently related to boggle v., bogle n., and bog n.2: if the status of the last-named were more assured, it would be natural to see in bogg-ard a derivative with the augmentative suffix -ard suffix; or if the occasional variant buggard could be assumed as the etymological form, it might stand in the same relation to bug n.1. See boglen. This entry was posted on November 6, 2018 at 12:08 pm and is filed under Holidays, Language and food, Language and medicine, Language and the body, Mascots, Pop culture, Signs and symbols. You can follow any responses to this entry through the RSS 2.0 feed. You can leave a response, or trackback from your own site.